It's very unusual for me to plan out our restaurants so far in advance of our summer travels. You never know where your day will take you or what your gang will be in the mood for. In the past I've done some research ahead of time, copied all the details to an email (which drives Mr. C&G nuts, he'd prefer it as notes on the iPhone) to print out and carry with me. Then as we're wandering I can check to see what's recommended nearby. When we leave that particular city, my notes go in the garbage (recycling of course) and I no longer need to tote the information around. This plan of attack won't work for us on our adventures this summer. One of our stops is a major bustling city, and I don't want to be stuck with hungry munchkins and a two hour wait for tables. I also don't want to waste our travel budget on meals that aren't worth it, or restaurants that are miserable tourist traps. Recipe for disaster. So I've been spending the past few days checking into restaurant options and making reservations online (thank goodness for the internet). I've been combing my usual sources and searching for restaurants that get mentioned more than once in a variety of places. I grabbed the Where Chef's Eat book off the library shelf the other day and so far 4 of my choices show up in there. That's a good sign! 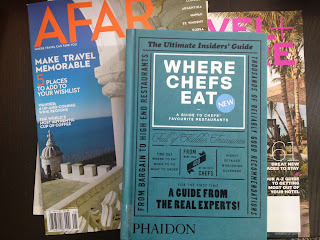 Where Chef's Eat highlights restaurants from around the world (and close to home), and while the descriptions aren't all that informative at least you have the name and location for starting a google search. It's also a nice mix of high and low end recommendations. Noma in Copenhagen (named best restaurant in the world in years past) is just a few paragraphs away from Ahaaa, a great Copenhagen falafel joint. 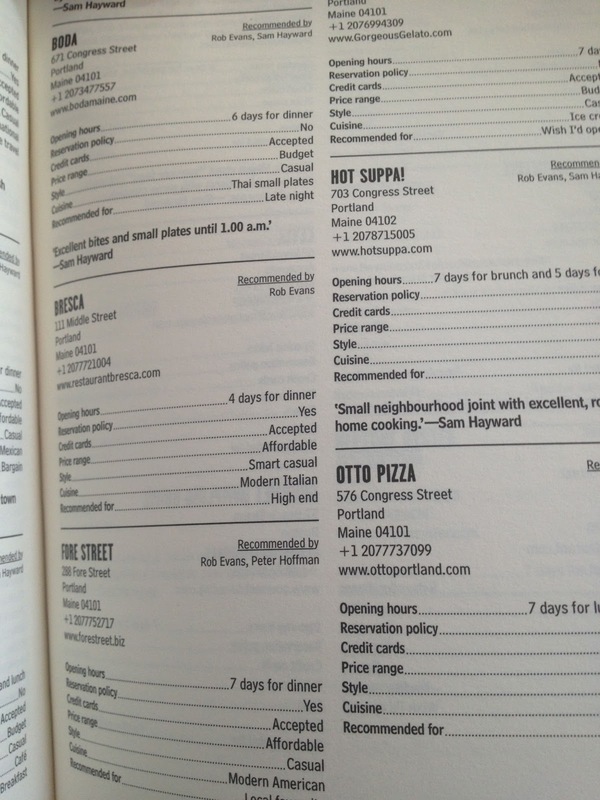 Of course the first page I turned to when I got home was the Portland, Maine section. 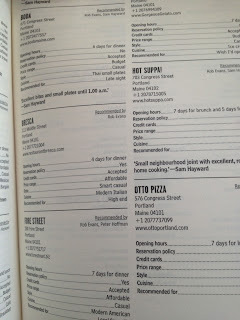 Otto's, Boda, and Bresca are all favorites so I knew this would be a good guide. If the travel books (or websites) you're using list the Hard Rock Café or Applebee's, then you know it's not where you want to get your recommendations from. But chef's know their food, and they're not ones to be wasting their hard earned dough on meals that aren't worth every penny, kroner, euro, or pound.